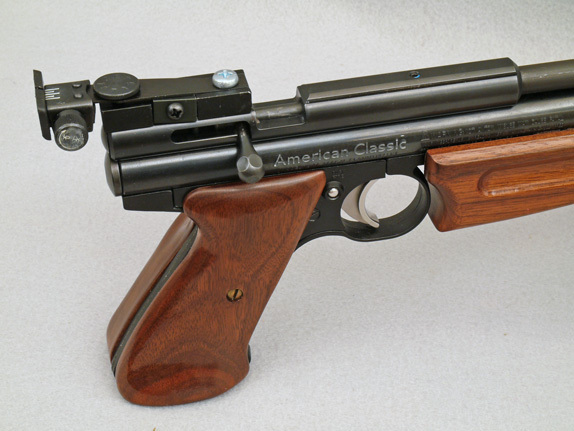 Archer on Airguns: Rear Sight Fits Crosman 1322, 1377 and 2240 Pistols. 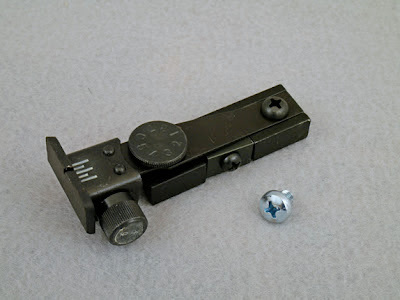 Stephen: I used this sight recently to replace the VERY flimsy factory rear sight on my Crosman Quest air rifle. Despite being closer to my eye when mounted on the front end of the scope rails, this sight works well. As you mention ,the scew had to be ground down. Thank-you for carrying these parts. Does this sight have elevation problems (gun shoots too high/low for front sight) when on a 1377/2240? Can it mount forward of the loading slot, or does the blade need to hang free of the body of the gun? We've not received any complaints about the gun shooting high with this sight and our test gun shot fine to the point of aim. To be honest, we didn't try mounting the scope ahead of the loading port, wanting the longest possible sight radius. Maybe someone else has tried this? I had the same issue with the gun not being able to adjust low enough. I believe that the front sight needs to be a little taller or modified to be a little taller (adding a nail cut to fit above front sight, rounded edges, and epoxied to the top of the blade???). If i lower the rear sight to its lowest adjustment i can not see the front sight. I bought this sight when I ordered a steel breech for my 2240. unfortunately the sight does not allow for accurate shooting with the standard front sight as the supplied screw head interferes with the line of sight and does not allow sufficient elevation adjustment. At its lowest setting the pistol fires about 6 inches high at 20 feet. We have other posts from readers describing the changes they made to the front sight that overcome the high point of impact that can be found with some of these pistols at close range. These were published on 12 April 2013 and 8 May 2010. (The quickest way to find them is to search by date in the right column of this blog). I hope they help. Buyers please pay attention to this. Attached to my Crosman Pumpmaster (1377) at 22ft the sight adjustment at its lowest setting shoots several inches high. ( Any other setting causes it to shoot even higher) Further, the screw interferes with the line of sight. I was hopeful for a solution for A rear sight since l added the steel breech, but instead l lost $21 w|Shipping.The search continues for rear sight. Hundreds of people are using these sights on their air pistols with success. And, yes, a few have experienced shooting high. If any of our products don't work as described, please contact Archer Airguns immediately. We'll offer a refund, exchange or advice, as appropriate.